Hollywood makes a lot of World War II movies — but the vast majority of them are told from the American perspective, in English. If you want to learn more about WWII in a more comprehensive manner, sticking to Hollywood isn’t enough. 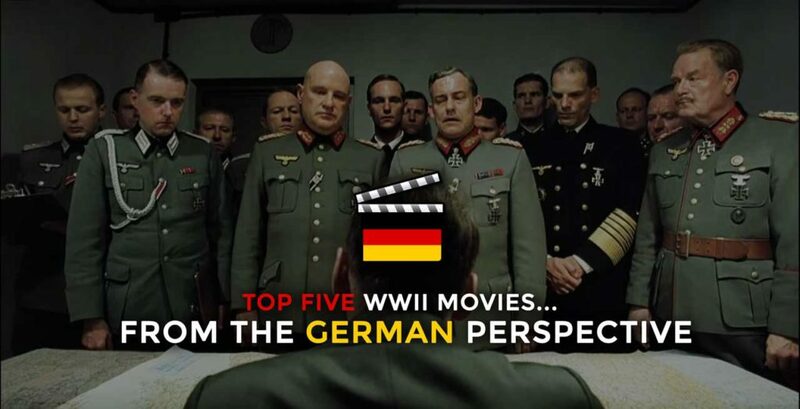 That’s why we’ve compiled this list of five best WWII movies from the German perspective, which will allow you to see the war from the other side. We tried to find films that are fairly recent, actually made by Germans, and won’t bore you to death — check them out! If you’re not into combat footage, then Sophie Scholl – The Final Days might be more your cup of tea. This 2002 movie centers on Sophie Scholl, a 21 year-old student in Munich who was guillotined in 1943 for distributing anti-Hitler propaganda. Today, Scholl is commemorated alongside other members of the White Rose student movement for standing up to Nazism at a time when few dared. Maybe you’ve heard of Valkyire, the 2008 movie starring Tom Cruise as Colonel Claus von Stauffenberg, a Wehrmacht officer who tried to assassinate Hitler. As it turns out, Stauffenberg wasn’t the only aspiring Hitler assassin in Nazi Germany. In fact, five years before Stauffenberg’s 1944 attempt, a German worker named George Elser planned and executed an elaborate (but unsuccessful) attempt to kill Hitler. 13 Minutes is a 2015 film based on Elser’s true story, its name inspired by the fact that Hitler missed Elser’s bomb by just 13 minutes. You could say that Nazi Germany’s defeat at Stalingrad in 1942 was the most important turning point of WWII… so it’s not surprising that quite a few films have been made about the battle. One of these is 1993’s Stalingrad, which depicts the battle from a German perspective. Stalingrad follows a platoon of Wehrmacht soldiers as they’re transferred from sunny North Africa to the Eastern Front, and shows the platoon’s descent into despair and death as the tide of war turns against them. This is the oldest film on our list, but it’s on here because it’s one of the most well-known WWII movies from the German perspective. Das Boot — translated as “The Boat” in English — depicts the trials and tribulations of a German submarine crew as their vessel, U-96, cruises the Atlantic and Mediterranean. Besides exhibiting the diverse personalities and backgrounds of U-96’s crew, the movie contains numerous tension-packed scenes of submarine warfare. If you’ve spent enough time on the internet, you’ve probably seen one of the many “Hitler reacts” clips where various parody subtitles accompany a scene of the Fuhrer getting mad. As it turns out, the original footage for that clip comes from one of the most renowned WWII movies from the German perspective — Downfall. Through the lens of his personal secretary, the film focuses on the last days of Hitler’s life during the Battle of Berlin. Besides showing the desperate machinations of Nazi leadership, it includes gritty combat footage, stirring depictions of the battle’s toll on Berlin’s civilians, and, overall, a historically rigorous yet entertaining look at Nazi Germany’s final days. Generation War is a TV miniseries rather than a movie, but we have to put it on here because it’s probably the most comprehensive cinematic depiction of WWII from the German perspective. You can think of Generation War as Band of Brothers or The Pacific, but from a German point of view. Set between 1941-1945, the series traces the lives of five friends in their twenties from Berlin. It intimately explores how the war shapes their lives across multiple dimensions. Two of the friends are brothers who are sent off to the Eastern Front with the Wehrmacht, giving us a view into combat between Nazi Germany and the Soviet Union. Another is a Jew who escapes into the forests, linking up with Polish partisans who fight Nazis. The two female characters end up as a nurse and a mistress to a high-ranking SS officer; they become portals through which we see how the violence of total war touched women as much as men. Though the series is not without controversy, it was one of the most popular German shows in recent memory, and is well worth your time if you’re interested in WWII from the German perspective. A good list. I’ve seen all of these except 13 Minutes and The Sophie Scholl film. But I’ll definitely watch both of those as soon as I can. Might add ‘The Book Thief’ to the list. It’s also worth noting that Stalingrad exists in two versions: an older dubbed version, which is awful, and a more recent subtitled version, which is brilliant.